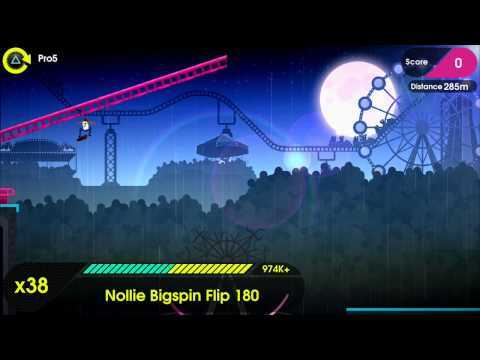 Get set to grind, flip and darkslide your way through the glamour of the silver screen in OlliOlli 2: Welcome to Olliwood. Split-level routes, an awesome soundtrack and a stack of all-new challenges await as you skate through Aztec jungles, ghoulish carnivals and palm-lined boulevards. Fancy taking the high road? Use the ups and downs of your environment to boost you into rad jumps and discover secret routes only reachable with a perfect launch. Test your skills, rack up the points and grab some serious air. All-new ramps, jumps and epic hills mean serious altitude – and serious scores. Push your combos to the limit with enhanced controls and an updated ‘Tricktionary’. Race against up to three friends in “Combo Rush” local multiplayer mode. Put your skills to the test with 50 new ability-based levels and 250 new challenges.